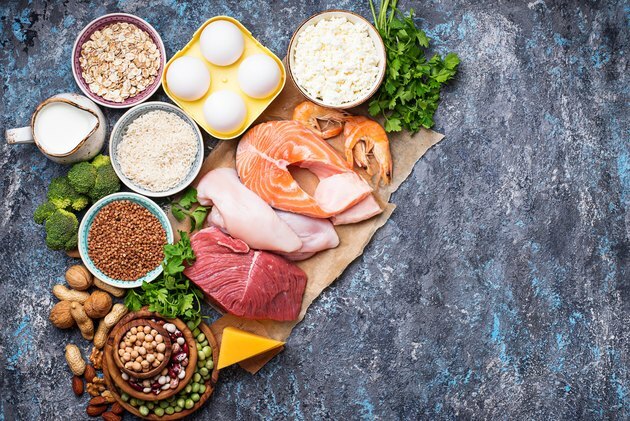 More than half of the U.S. population is eating too much protein, according to the latest Dietary Guidelines for Americans. The report also highlights a lack of variety of protein sources in the diet and a tendency toward nutrient-poor choices. The amount of protein you need each day depends on your age, weight, gender and activity level. If your requirement is 50 grams of protein per day — or per meal — ensure that it comes from a variety of nutrient-rich sources. The recommended dietary allowance, or RDA, for protein is 0.8 gram per kilogram of body weight. This is the amount suggested for all adults to meet basic nutritional needs. The calculation for determining your daily protein is to multiply your weight by 0.36. So, for example, if you weigh 135 pounds, you'd need about 50 grams of protein each day. But your weight isn't the only factor that determines your protein needs. Typically men need more calories than women, so their individual macronutrient needs are increased, and older people need more protein to counter age-related muscle loss. Very active people and athletes also need more protein than the RDA. According to the International Society of Sports Nutrition, people who exercise may need as much as 2 grams of protein per kilogram of body weight per day. Using this estimate, a person who weighs 165 pounds may need to get 50 grams of protein at each meal. If you like to snack during the day, remember to add that to your total for the day. If you can't quite make 50 grams at each meal, you can make up the difference in one or two protein-filled snacks such as nuts or hummus with cut-up veggies. ACE: Do Men and Women Have Different Nutritional Needs? How Come I Get Really Hungry After Eating a Healthy Meal?